Route 66 is just about bookended by amazing historic theaters - the Rialto in Joliet and the sadly-deteriorated Rialto in Pasadena. And all along the route are sprinkled grand bastions of the early 1900s entertainment industry such as the KiMo in Albuquerque, the Coleman in Miami (Miam-uh), and the Wildey in Edwardsville, all three of which are restored, open, and operating. In the interest of fostering some positive interest in the 2015 Edwardsville Route 66 Conference, I'd like to introduce you to the Wildey Theatre at 252 N. Main Street. The City of Edwardsville (owner of the Wildey) has committed our star venue for the conference weekend Halloween weekend 2015. By the way, the Wildey stood just a half-block from the earliest Route 66 alignment through the city. When the route was moved to its main alignment through town, that added another block. Wildey Theatre photo by Cindy Reinhardt. The Wildey was constructed in 1909 via a partnership between the Independent Order of Odd Fellows (IOOF) and a group of Edwardsville businessmen (the Edwardsville Investment Company). The IOOF meeting hall was established on the third floor, the main floor held the beautiful auditorium/theatre space, and the second floor was known as the "Music Hall," where smaller concerts and entertainments could be held. The theater is named for Thomas Wildey, an Englishman who helped to found the IOOF. 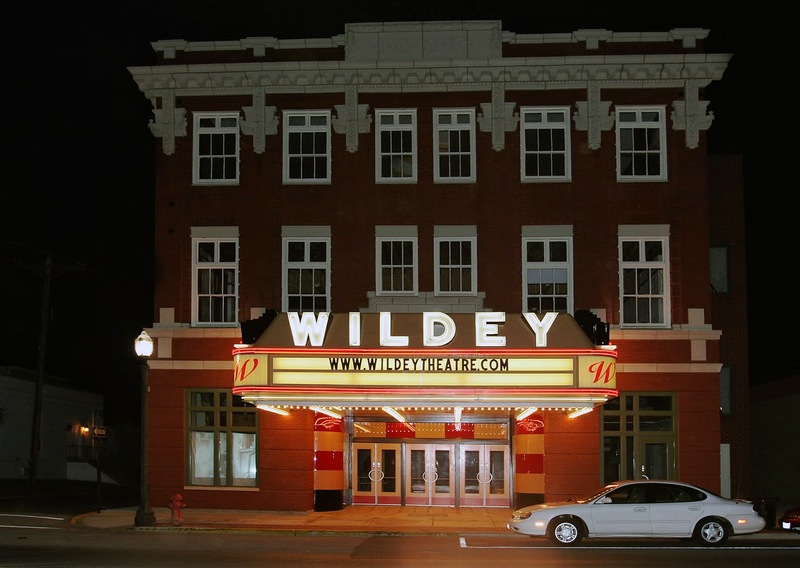 The Wildey immediately became the community's center for arts and entertainment, and that still holds true. The exception was a period of 27 years of inactivity followed by its rebirth a few years ago. Back in 1937, a major renovation was undertaken and the Wildey held strong for many years afterwards. During the 1980s, the theater fell on hard times and the screen went dark. It closed on March 8, 1984, after a showing of "The Big Chill" - an apt title, perhaps, for a swan song. Eventually the city purchased the building and a campaign to restore the beautiful edifice ensued. The Wildey reopened on the 102nd anniversary of its original opening, on April 12, 2011, to acclaim - a "restoration success story." It serves the City of Edwardsville and surrounding communities as an arts and entertainment center, hosting community events, concerts, films, and conferences. For the last couple years, it's received the honor of being the only Illinois venue for the SLIFF - the St. Louis International Film Festival. Leo Kottke, Judy Collins, Mitch Ryder, and the Zydeco Crawdaddies are just a few of the "names" that have played the Wildey in the past couple years. Going back to much earlier history, the Wildey hosted the likes of Ginger Rogers, Al Jolson, and W. C. Fields. Now it's preparing to host the Route 66 community! Wildey Theatre photo by Scott Evers. Although Edwardsville has much event planning and many decisions yet to make, I expect the confirmation of the Wildey as the conference venue to help set the tone for the weekend - classy, historic, gracious, constructive, and fun! Some local color - Herbie the Cow atop Edwardsville Frozen Foods, another landmark next to the Wildey. Photo by Cindy Reinhardt.